Cyclic Catastrophism, the subject of this blog site, is unique because it explains the origin of every feature observed on Mars by NASA probes based on ancient texts and art. But it also predicts the most unique feature on Mars – one currently hiding under the northern icecap, which cannot be explained by any currently accepted astrophysical process. The ancient texts make clear that the formerly living planet, priori-Mars, was captured in a geostationary (44,400 km) orbit of the Earth for a period of 14.4 years and then released into an orbit of the Sun for 15.6 years and that this 30-year cycle was repeated one hundred times, resulting in the loss of all its soil, water, atmosphere and biosphere to the Earth, between 3687 and 687 BC. Because of the pronounced bulges on its surface, now called the Tharsis Bulge and its antipode (since settled isostatically), the spin axis (the north pole) of the lithosphere of Mars was forced to remain oriented toward the Earth while in geosynchronous orbit. Upon each capture, the tidal force of the Earth first drew all the water in the northern hemisphere of Mars toward its north pole (outflow channels), forming the Oceanus Borealis (northern ocean). Over a period of months, the same tidal force melted subsurface rock and drew it to the surface where it formed an island still present, rising 3 km above its north pole. The single most unique planetary feature then rose from the center of the island, an enormous lava fountain, was drawn down toward the Earth and, as a result of the formation of vertical lava tubes, attained a height of over 2000 km. This column was continually fed by a stream of lava flowing through a volcanic vent which extended deeper and deeper inside the planet during each capture. This glowing, flaming feature was the primary deity in every culture on Earth between 3687 and 687 BC: the Vedic Purusha, the Hindu Brahma, the Greek Zeus and the Egyptian Osiris. It was also called the ‘tree of life’, ‘the lotus that grew from the navel of Vishnu’, the Egyptian tuat or djed pillar, the ‘axis mundi’ (axis of the worlds), the upside-down tree of the shamans, the ‘column of smoke and fire’, and was the inspiration for the totem poles of the Amerind peoples. It was also the Greek Atlas, imagined to prevent the enormous planet, stationary in the heavens some 530 times the area of the full Moon, from falling to the Earth. But after 14.4 years in this geostationary orbit priori-Mars would amazingly escape into an orbit of the Sun for 15.6 years by a process that no astrophysicist today has ever imagined, involving the hardened lava column – more precisely the deep volcanic vent from which it arose. The escape occurred when the alignment of the Sun, Moon (at a vernal equinox), proto-Venus (at inferior conjunction and aphelion) combined with the Earth to exert a tidal effect that convulsed Mars’ interior, simultaneously causing the great hardened lava column to collapse and the northern ocean to rise above the island and rush down into the volcanic vent, flowing all the way into its liquid outer core where it flashed to steam creating an enormous pressure that forced the solid core of the planet, known as Hathor, Hermes, Sarama and Mercury out through the enormous fault on the equator of Mars, known as the Valles Marineris. It is certain that Sut went down south to some sort of nether-world, and so became the power of darkness in Amenta, when our earth had been completely hollowed out by Ptah, and Amenta below became the south to the circumpolar paradise in the celestial north. The ancient Egyptians had no antipodes on the outside of the earth. Amenta in the nether-world was their antipode. Their two poles were celestial and sub-terrestrial. The north pole was at the summit of the mount. The south pole was in the root-land of the earth below. The Ritual describes the ways of darkness in the entrance to the tuat [duat] as the tunnels of Sut, which tends to show that a way to the nether-world was made by Sut when his star and standing-ground went under in the abyss of the beginning in the south, where the Egyptians localized the tuat or entrance to the under-world, which was the place of egress for the life that came into the world by water from “the recesses of the south”. The fact that the Egyptians could not see the actual antipode of the ‘earth’, reinforced the idea that the passage was referring to the our Earth on which they lived, and that the deity Ptah had hollowed it out. But Massey reveals his doubt when he states “The Ritual … tends to show a way … “. This part of the passage is actually describing the events at the expulsion of the solid core. ” … when his star and [the] standing ground went under the abyss … ” describes the passing of proto-Venus (Sut’s star) behind, i.e. becoming aligned with priori-Mars, and as a result of its added (indirect) tidal effect, the northern island (the duat or standing ground) went under the northern ocean, the Nun, ” … the abyss of the beginning… ” (because this ocean formed at the beginning of each encounter). Of course the occluded proto-Venus also appeared to be under the ocean, at least metaphorically. The Rg Veda describes the same event stating ” … Agni (proto-Venus) was concealed in the waters … “. The ultimate result of the the abyss waters draining into the interior and ejecting the solid core was that each time this happened it forced priori-Mars to leave the vicinity of the Earth – which was the reason that Sut was considered Horus‘ enemy. This is a specific form of the very common myth that the ‘home god’ was forced to leave the earth and join combat with the ‘intruder god’. At the end of each encounter the glowing solid core first protruded through the Valles Marineris. The Egyptians called it the ‘eye of Horus‘, but when it continued out into space as an independent body and zoomed low around the Earth to the East, they called it Hathor. This sling-shot maneuver around the Earth, allowed the solid core to catch up to the outer shell in only eight days as it drifted away from the Earth to the west, and reentered the open gash “cleaving its firmament”. They recombined completely in the next 15.6 years, while orbiting the Sun. The re-formed priori-Mars was subsequently recaptured in a geostationary orbit of the Earth at Nov. 1st , continuing the 30-year cycle which was repeated for 3,000 years, as proven by the fact that every Egyptian dynasty wrote of these events. 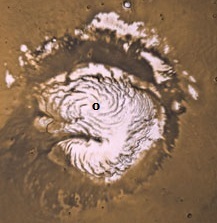 O marks the location of the Drain Pipe at the North pole of Mars, filled with ice extending deep into its core. Upon the last separation of Mars’ solid core (687 BC), it failed to reconnect with the outer shell, and was deflected into the inner solar system where it ‘cavorted with Venus’ for a few hundred years before both bodies settled into their current orbits. The Greek name for the former solid core was Hermes, but of particular interest today, its Roman name was Mercury, the name now used universally for the sulfur-coated solid iron ‘planet’ closest to the Sun. At the same time the laws of conservation of angular momentum and energy dictated the outer shell, Mars, collapse in on itself and drift out into its current orbit. With most of its atmosphere and water having been lost to the Earth between 3687 and 687 BC, the last of the water on priori-Mars, which was still swirling down through the vent drain pipe into its core, froze in the form we see today, the whirlpool-shaped northern polar ice deposit. The fact that the whirlpool flows up and over the 3 km high northern island, in itself corroborates Cyclic Catastrophism – another feature to which NASA scientists have paid little attention. But they will not be able to ignore the most unique feature which Cyclic Catastrophism predicts here – a long narrow column of ice that descends from the north pole, at the very center of the whirlpool, deep into the core of Mars. I have marked its position to help NASA find it. This is the geologist … and this the mathematician, Gentlemen, to you the first honors always! Your facts are useful, and yet they are not my dwelling, I but enter by them to an area of my dwelling. ~ by Angiras on September 25, 2013.